With the PinPoint Targeted Integration System you can get controlled, single-copy integration of your PinPoint Donor Vector at a pre-placed PinPoint attP site. 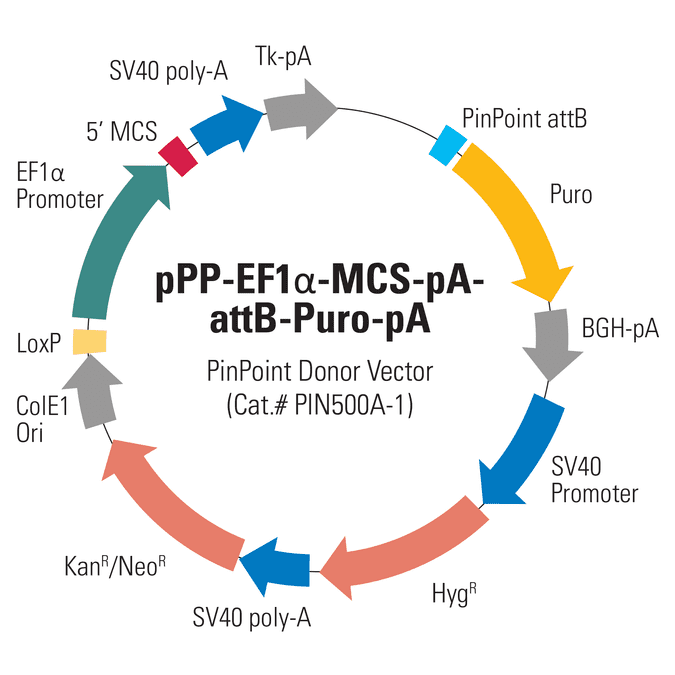 The EF1α PinPoint Donor Vector (pPP-EF1α-MCS-pA-attB-Puro-pA; Cat.# PIN500A-1) uses the moderate EF1α promoter to drive your gene-of-interest, and includes a promoterless puromycin marker—proper integration into a PinPoint attP site inserted using any of SBI’s PinPoint Placement Vectors (Cat.#s PIN300A-1, PIN400A-1, and PIN410A-1) results in a PGK promoter positioned to drive the puromycin marker, enabling selection for the desired integrants. The vector also includes a LoxP site to mediate removal of most of the unnecessary vector sequences and both kanamycin and hygromycin markers for cloning and propagation. When you use any of SBI’s PinPoint Placement Vectors (Cat.#s PIN300A-1, PIN400A-1, and PIN410A-1) to insert the PinPoint attP site, the PGK promoter on the Placement Vector combines with the promoterless puromycin marker on the EF1α PinPoint Donor Vector (pPP-EF1α-MCS-pA-attB-Puro-pA) to enable puromycin selection only if the PinPoint Donor Vector integrates at the correct site.